Register Log In AmbergrisCaye.com Home Forums Nature Help preserve the species: go on a croc tour! Ever had a live encounter with a crocodile? It’s really not that scary, especially when it’s for conservation. 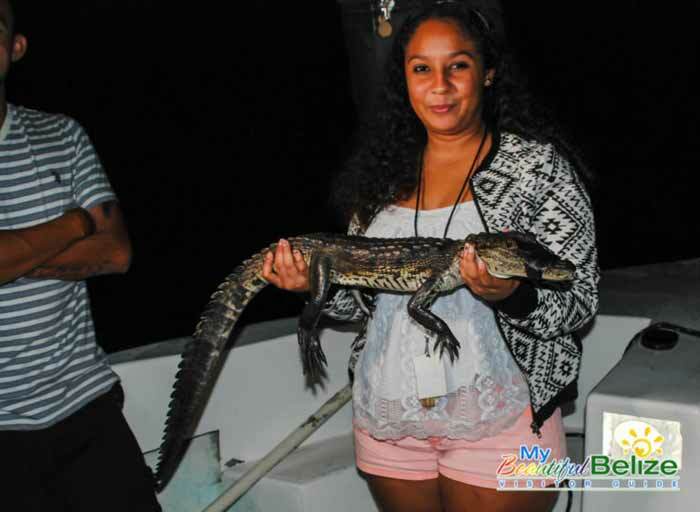 In Belize there are two types of crocodile – the salt water American Crocodile and the fresh water Morelet Crocodile. For years the non-profit American Crocodile Education Sanctuary (ACES) has been working to protect and preserve these apex predators in Belize. A unique method they have taken to preserve these species is through education via the tourism industry. ACES has trained several tour guides to provide eye shining tours in an effort to educate people on the importance of crocodiles to the ecosystem. The tours were initially offered only in San Pedro Town – ACES’ base for operations – but now they are also available in mainland Belize. While on the tour you join a team of trained crocodile experts as they capture crocs for analysis and tagging. In San Pedro, research is conducted on American Crocodiles, while in the mainland it’s Morelets. Using flashlights, the guides flash around the waters looking for the red eyes of the crocs. Once a croc is spotted, the boat slowly makes its way to the area and a wrangler hooks on to the crocs’ head using a net hook. When the croc is pulled on board, their mouth is taped up – you don’t want a croc snapping your fingers off! The guides then record data on the croc, like its measurements and estimated age. Finally the croc is tagged and released. These tours are entertaining for sure, but they also provide so much research data for biologists, ad best of all, proceeds from the tour go towards conservation and research efforts.